Almost seven years ago a devastating fire destroyed the entire Bella Costa Tobacco Plantation. All six building went up in a sudden, uncontrollable blaze. These buildings housed their awesome five and seven year aged Habana 2000 Wrappers, hundreds of bales of hand selected Bella Costa filler and binder tobaccos, rolling rooms, aging sheds, box making warehouse and so much more. It was a total loss. Eight years later...The all new Bella Costa Gold Cigar Company is back. Back with their finest cigar creations ever! These all new Premium Bella Costa Gold Vintage Reserve Cigars have now returned after an extensive six year aging and an all new Habana 2000 Colorado wrapper. The beautiful six-year-old reddish-brown, slightly oily Habana 2000 wrapper is just the beginning of what makes this fine cigar stand out above the many premium brands available today. 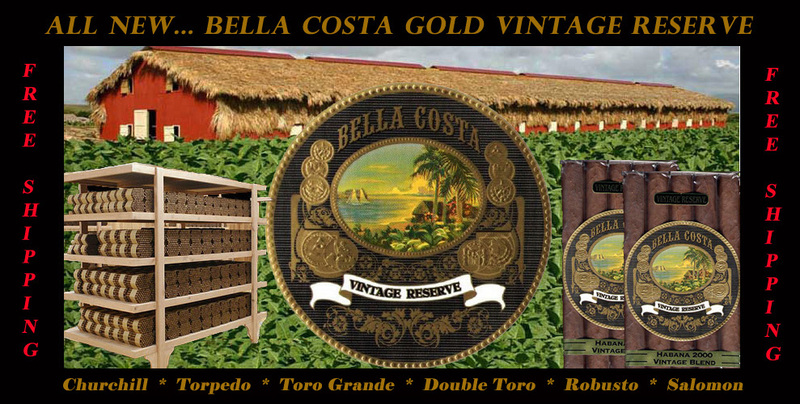 The new Bella Costa Gold Vintage Reserve has been masterfully blended using only the finest hand selected and properly aged Dominican "Gold Suprema", and long filler tobacco leaves grown, cultivated, and aged at the new Bella Costa Plantation. The new Bella Costa Gold cigars deliver a smooth, even draw, mild-medium cigar with lot's of great taste and aroma. A cigar of superior smoking pleasure. Gone are the fancy engraved wooden boxes and the gold embossed labels in order to reintroduce and deliver this great tasting premium smoke at a price that will allow this cigar to become, once again, a top favorite of all who experience the new Bella Costa Gold Vintage Reserve.